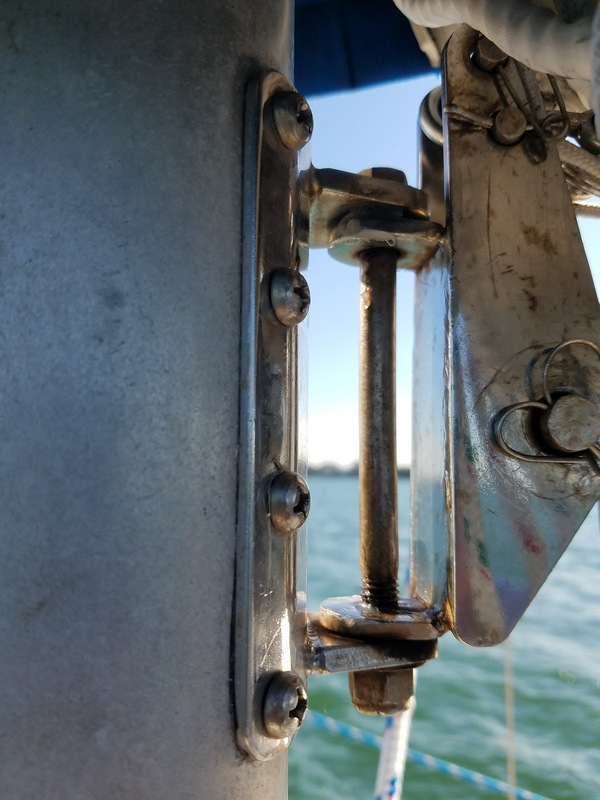 While on our weekend trip in Biscayne Bay, I noticed that the Bolt that holds the Boom Gooseneck fitting is badly corroded, if that failed, then the front end of the boom would not be attached to the mast and would slam about trying to damage all sorts of things, including the Mast! That long, vertical bolt doesn't look so bad, but up close I thought the lower end just above the nut looked very worn. Changing it out should not be a big deal, but as it supports the weight of the Boom, Sail, Sail bag and the strain imposed by the Boom control rigging (Main Sheet, Vang, Reefing lines #1 & #2 and the Topping lift) I'm going to secure the front end of the boom before removing the bolt. I'll just wrap the Main Halyard around the Boom, Bag with a Loop onto itself. I would also like clean up the surfaces and apply some Super Lube to the two surfaces at the top and bottom of the fitting. I have the bolt (ACE Hardware) and just need a Rain free day to do this, I'll use my Dremel to polish the whole assembly. 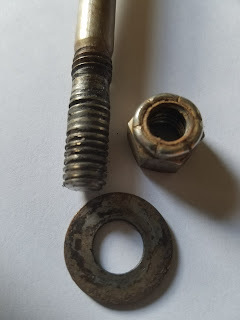 Here's what the threaded part of that bolt looks like. Not as bad as I thought, but heading in the wrong direction. The bolt is 3/8" x 5" with a Nyloc Nut. New bolt (thanks ACE Hardware) installed. Install was almost as anticipated. 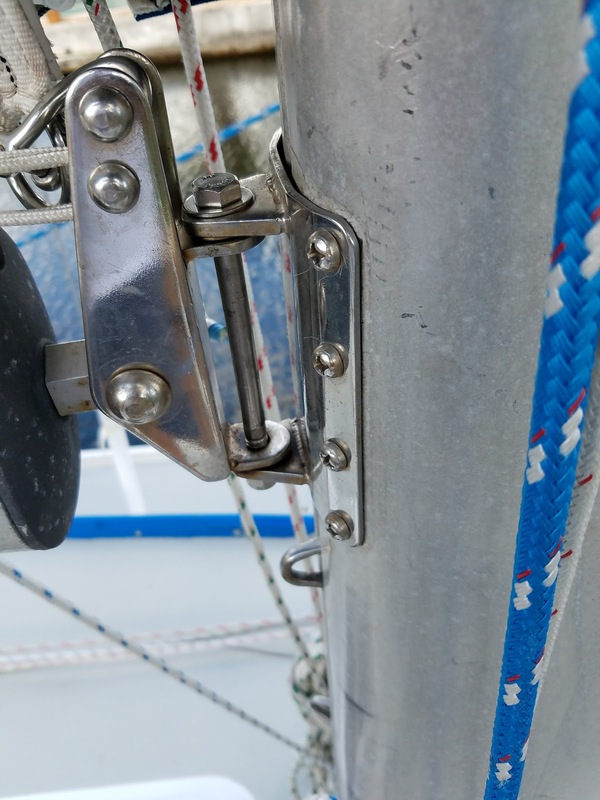 Once the bolt was partially removed, the gooseneck fitting pushed forwards against the mast plate. I used a big flat head screw driver to ease the lower bracket away from the plate and popped a spare short bolt in the two holes at the bottom of teh gooseneck to hold that part in place. Then eased the bolt out of the top and inserted the new bolt. Another job crossed off the ToDo list.